Russia. Ivan IV (the terrible) as Grand Prince. AD 1533 to 1547. Size : 9.5 x 11.0 mm. Weight : 0.29 grams (This is a fairly small coin). Grade : VF on a typically oval flan with just one hind leg of the horse, and part of the inscription off the flan. Fairly nice for this type. 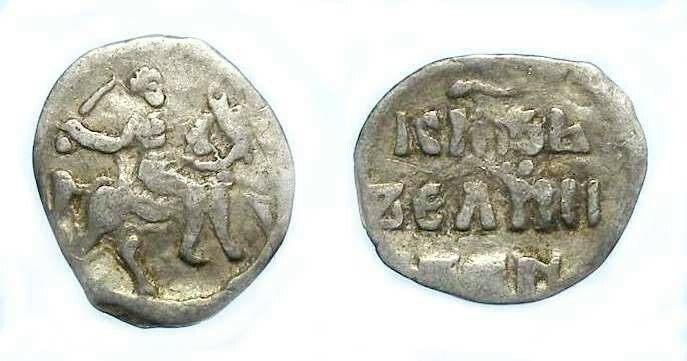 Obverse : Ivan on horseback brandishing a sword. Reverse : Cyrillic inscription naming Ivan as Grand Prince. These small coins are commonly known as wire money as they were struck on flans cut from lengths of wire. All have shear marks at the ends, resulting from how the wire was cut up. The flans are generally smaller than the dies, so only very rarely one of these show the complete images as it was engraved on the flans.